The beginning of the New Year marked the end of the inaugural JumpFly Cares fundraising initiative. JumpFly Cares is a new quarterly program at JumpFly designed to raise money and awareness for causes that matter to JumpFly employees. All staff are encouraged to submit their preferred charity into a drawing from which three charities are chosen. The three JumpFlyers whose causes are chosen then do a short, five minute presentation on their charity and all participants vote on which charity they wish to support. The chosen charity for Q4 2018 was the Free Spirit Siberian Rescue located in Harvard, Illinois. This charity was presented, voted on and selected by JumpFly employees as the first-ever, JumpFly supported cause. 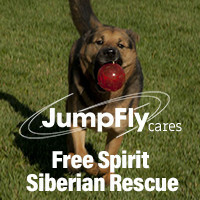 In order to support this worthy cause, JumpFly employees were asked to purchase items from the Amazon wish list for the Free Spirit Siberian Rescue, drop their spare change in a jar and/or bring in donations to be delivered to the rescue after the fundraising was over. Over the duration of this endeavor, over $1,107.88 worth of Amazon wish list products were purchased and delivered to the Free Spirit Siberian Rescue on JumpFly’s behalf. JumpFly staff also donated $52.18 in spare change and more than 25 large garbage bags full of blankets, towels and miscellaneous items that could be used at the rescue. The Free Spirit Siberian Rescue was very grateful for all the JumpFly contributions and excited to go through the mountain of donation bags that were dropped off. JumpFly Cares is incredibly proud of the generosity of JumpFly employees and excited to continue the charitable contribution program through the new year and beyond. Karen Ferreri-Miller founded Free Spirit Siberian Rescue in 1999. This rescue works to foster respect, understanding and compassion for all creatures, and the believes that all life is valuable and worthy of protection. The Free Spirit Siberian Rescue mission is to adopt and save as many dogs as possible; to help those that are helpless; and to reduce the number of homeless Siberian Huskies while improving the welfare and education of domestic animals. Since the founding of Free Spirit in 1999, it has adopted more than 1070 dogs and counting. JumpFly professionally develops, implements and manages Google, Bing, Facebook and Amazon advertising accounts, enabling clients to maximize results while saving time and money. Proper setup and management of these unique ad platforms often determines an advertiser’s success or failure. JumpFly’s full-service solution enables clients to focus on their core business while achieving the best possible results from their digital advertising campaigns. JumpFly is a Premier Google Partner, Facebook Certified Partner, and Bing Elite Agency. JumpFly assists more than 400 clients and has an A+ rating from the BBB.